This tour includes full board. In the mornings, you will receive a hearty breakfast, in the evenings you can choose between 2-3 menus. For the bike tours we provide you with packed lunches. 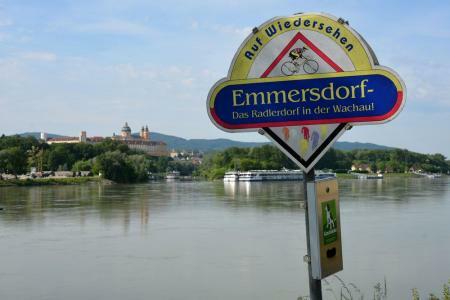 On this varied tour by bike and ship along the Danube, you will experience both rural Austria - the Danube valley, Strudengau and Wachau regions - and the effervescent capital cities of Vienna and Bratislava. Your tour commences on the unmistakable MS Theodor Körner, which presents itself as a classical river cruise-ship and offers varying types of cabins that cater to everyone's wishes. This tour along the Danube with the MS Theodor Körner can wholeheartedly be recommended both to novices and experienced riders. With a historic centre full of Mediterranean vibes, this town is picturesquely situated between the rivers Danube, Inn and Ilz. Embarkation: 4 pm, departure at approx. 6:30 pm, cruising through the Danube valley. Cycling through the ancient cultural landscape of the Machland region is very easy-going, while the small town of Grein in the Strudengau is positively sublime. The ship will later take you to Devin. Today’s ride will take you along the former “iron curtain”. The highlights include Devin Fort, Hof Castle and obviously the city of Bratislava. Around midnight, the ship will take you to Vienna. There are several optional packets available to book, or why not go ahead and explore the city under your own steam. 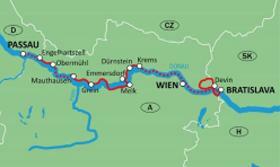 Around midnight, the ship will take you to the Wachau region. The Wachau region charmingly presents itself with several small vineyards and apricot trees. You will be able to buy wine, schnapps and apricot jam directly from the producers. Melk diocese, the pilgrimage church of Maria Taferl, the mythical Nibelungengau region and the rough Strudengau are right on the top of today’s list. The cliffs to the left and right of the Danube are steep and covered with dense forests, while the region surrounding the Trappist monastery of Engelszell is very sparsely populated. Enjoy cruising into the baroque episcopal town, disembarkation starts at approx 10:00 am. Here are the details on MS Theodor Körner. We offer comfortable unisex-bikes with 7-speed gearboxes and coaster brakes or 21-speed freewheel systems, equipped with a bike bag and a bike lock. We also offer e-bikes if desired. Minimum number of participants: 50. This tour can be cancelled by the provider up to 4 weeks prior to its commencement. If this is the case, we will strive to supply our customers with an equivalent offer. All prices are per person in a double berth cabin.